Google (s GOOG) has long pushed the envelope of data center infrastructure design, particularly when it comes to renewable energy, efficient cooling, new power electronics and innovative building layouts. And according to Joe Kava, vice president of Google’s data centers, Google’s data center strategy roughly follows Google’s original 10 core defining principles that the company’s founders wrote out when it was still very young. 1). Focus on the users and all else will follow: Google’s audience is global, so it’s not surprising that the search giant is looking to build data centers across the globe to serve different regions of the world. By placing servers as close to users as possible, Google cuts down on the time it takes for users to use its tools and do search queries. Kava said Google processes 1 billion search queries across its global users per month. Picking locations, and constructing data centers, is ultimately a UX issue for Google. 2). It’s best to do one thing really, really well: Google by some guesses has built as many as 40 data centers, so it’s safe to say that Google has the process of finding a location and building a facility down pat. Over the years, the company has included in its criteria things like finding a good local workforce and accessing a robust electric grid as key qualifications. More recently, Google has increased the importance of greener issues like finding a location where the utility offers a significant amount of renewable energy. 3). You can be serious without a suit: Even though Google doesn’t care about how data centers look from the outside, it aims to bring a piece of the alternative Google culture from its HQ to its server farms. Kava showed a slide of a colorful recreation room at a data center to emphasize the company’s “work hard, play hard” philosophy. 4). The need for information crosses all borders: This philosophy relates to at least two aspects of Google’s data center operations. First the move to putting data in the cloud makes it easier for users to access data wherever they are. 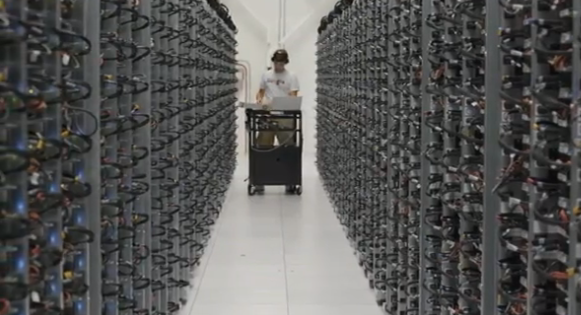 Second, Google is looking to be transparent about the metrics for its data centers. Given the importance of energy in designing and running data centers, Google has opted to make public some of its internal energy consumption data. 5). You don’t need to be at your desk to get answers: Google searches for interesting and unusual solutions for some its data centers across the globe, and far outside of its Silicon Valley roots. For example, Kava highlighted its data center in Finland that uses the cold outside air and sea water to cool its servers. The data center is inside a former paper mill, and Kava noted that Google has re-used pumps and other electrical equipment from the mill to operate its servers. It’s a highly unique design and one of the only ones like it in the world. 6). Faster is better than slow: In Google’s philosophy, the term efficiency doesn’t just refer to how Google wants to use electricity to power servers. How quickly Google designs and builds data centers is equally important, Kava said. He pointed to a data center in Georgia that took 16 months rather than 2-3 years as an example of how the company has created a set of standards for designing and building data centers. 7). Great just isn’t good enough: This rule has to do with setting higher goals, and Kava used it to describe how Google also allows room for customizing data center designs to make better use of local resources. For example, the company relies on the cold outside air instead of a chiller to cool its data center in Dublin, Ireland. 8). There is always more information out there: Google is currently on the fifth generation of its data center designs, but Google still continues to learn and improve its process. Sometimes that means that Google has to learn techniques and skills outside of its core competency. The need to cool servers and reduce wasteful energy consumption has forced Google to develop an expertise in designing systems to transfer and use energy more efficiently. In addition, to make the most use of the indoor space of its data centers, Google has designed the layout of its servers to maximize the effectiveness of cooling systems. 9). You can make money without doing evil: Reusing waste water is a good example of something that Google can do for both economic and eco reasons. In Belgium, Google has built its water treatment plant to take water from a canal nearby suitable for industrial use. The company also uses treated wastewater for its data center in Georgia. 10. Democracy on the web works: O.K. this one is a bit of a stretch. Yes, democracy does work, indeed, Kava said, but it’s hard to draw a connection between this last rule and Google’s data centers. I’m surprised Google hasn’t built a data center in Western New York. It stays cold roughly 7 months a year, bordered by 2 of the great lakes, and a hydro-electric plant fed by Niagara Falls. Maybe the politics and taxes are keeping them away? I know Yahoo has already run all the fiber-optics. I worked on that data center. Ezra’s rules for designing web pages: 1) Put all the body text in the same size. Don’t arbitrarily set items 3 and 5 in a smaller font, as this makes it hard to scan and leads readers to wonder what distinction is being conveyed. 2) Use good grammar, especially in bold-faced text, or confusion can arise. For example. if the item reads “Great is just isnâ€™t good enough,” should we understand that great IS or ISN’T good enough? Thanks for flagging. #1 is a bug that is driving us crazy, and not a deliberate design decision. #2 was a typo, and both are fixed. The first rule of data centers is you don’t talk about data centers.